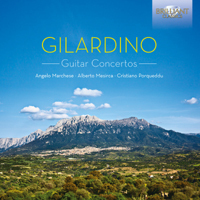 "A program of Guitar Concertos from contemporary Italian composer Angelo Gilardino (b. 1941). Gilardino is a highly individual composer whose music evokes the Mediterranian environs. Played by three virtuoso guitarists: Angelo Marchese, Alberto Mesirca and Cristiano Porqueddu. Booklet contains detailed notes and biographies for each of the guitar soloists."